« Homepage / Gourmet / "The Shell Game: for the love of Louisiana oysters"
There is nothing quite like eating a raw Louisiana oyster. Salty and succulent with a slightly sweet finish, it is a superior bivalve. An entire culture springs from the raw desire to devour these luscious mollusks on the half shell, drenched in plenty of hot sauce and horseradish. The proper way to do it, of course, is at an oyster bar. The ritual of watching the oysters being opened, then getting that first, cold, fresh one is a moment of utopia for aficionados. Louisiana is strewn with abundant oyster bars. Some are only open in the months without an "r" in them, like Casamento’s on Magazine Street in New Orleans, which closes down for the summer months. September brings the rejuvenation of the oyster "season" and business is picking up again. 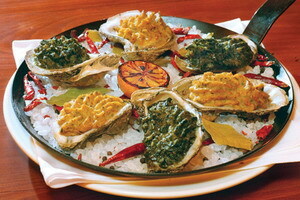 We have an abundance of good oyster dishes throughout the state. Many people are dedicated to promoting them. The 2007 Louisiana oyster promotion campaign in February featured oyster cooking demos and special events in the French Quarter, including a 340-foot oyster po-boy being served on Bourbon Street (it ran the length of one full block and contained 5,200 Louisiana oysters, with a retail price of $30,000). The cultivation of oysters has developed markedly over the years. Early French settlers were reported to have harvested oysters, and as they rose in popularity, their distribution also expanded. In the mid-1840s, Croatian-Slavonian immigrants moved to Louisiana and began fishing for oysters in the waters adjacent to the Mississippi River below New Orleans. 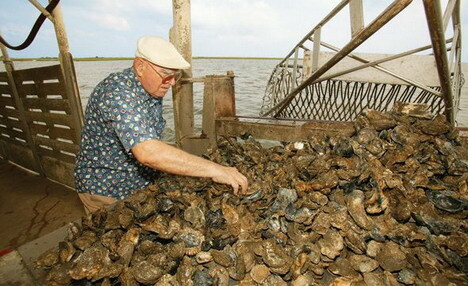 While the Croatians were developing the oyster industry in estuaries near the Mississippi river, the Cajuns were doing the same in coastal areas farther to the west. The Louisiana oyster industry currently is one of the most successful in the country; its continued success appears evident. 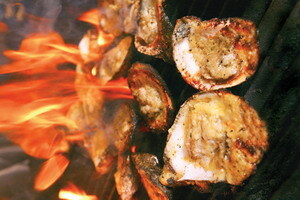 Aside from eating oysters on the half shell, one of the best ways to enjoy a Louisiana oyster is charbroiled. At Drago’s in Metairie, the oysters are selected by the company’s own fishermen, Croatians, who have been harvesting oysters for many years. This is the home of the original charbroiled oyster. In 1993, Tommy Cvitanovich, second generation owner of Drago’s, decided to put some oysters in their shells on the grill with a special butter sauce and some Parmesan cheese, and the dish gradually became popular. Today, Drago’s enormous grills turn out around 900 dozen a day of the now legendary charbroiled oysters. There have been many interpretations of the charbroiled oyster. The chic One Restaurant and Lounge in New Orleans has a delicious version, utilizing Roquefort and a vinaigrette, which adds a robust tangy afterglow. Grab a seat at the food bar and watch the chefs go to work in the open kitchen. Richard’s, a casual dining oasis in Abbeville, has excellent charbroiled oysters that make you long for at least a dozen more. They smell wonderful. 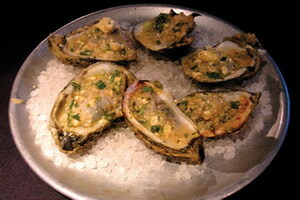 In the center of town is Black’s (which recently reopened), also featuring charbroiled oysters. Dupuy’s a block away has fried oysters, an oyster sampler, and fresh raw oysters on the half shell. When Joseph Dupuy first started harvesting oysters from the Gulf in the late 1800s, it was before the power motor. His son Ferdinand Dupuy took over the business in 1928, transporting the shellfish by truck and serving oysters on the half shell for five cents. During the Depression every shipment drew crowds. The building where the Dupuy’s peddled their seafood is the home of Dupuy’s Oyster Shop. Even though raw and charbroiled oysters are popular, some people prefer fried oysters in po-boys, skewered, on the half shell with elegant sauces, and in salads. Morton’s Seafood in Madisonville, on the lovely Tchefuncte River, serves a first-rate oyster boat. Hollowed bread is stuffed with plump, salty fried oysters in opulent proportions. Oyster and artichoke soup, and spinach salad with flash fried oysters are also popular there. The Acme Oyster Bar in Covington takes the fried oyster to a new level with its Cajun sushi. Fried oysters are served with wasabi, Tabasco sauce, and chopsticks. Of course they make great oyster po-boys as well and there are raw oysters galore. Galatoire’s Bistro in Baton Rouge has the ever popular oysters en brochette, skewered with bacon. At Dakota in Covington, the oysters en brochette are also skewered then corn-fried, served with crispy fried spinach. The fabulous truffle oysters come grilled with truffle garlic rosemary butter and are served with a hearty mustard greens and cornbread cobbler. The expansive Bourbon House in the French Quarter has a large terrazzo oyster bar inlaid with mother of pearl. Check out the inviting oyster carousel laden with fresh Gulf seafood. You can order your oysters on the half shell with or without caviar (wash them down with the refreshing frozen bourbon milk punch). Another good way to enjoy the oysters with caviar is on the plateaux de fruits de mer, which includes Gulf shrimp, marinated crab fingers, seasonal seafood salads, and fresh lobster. A flute of champagne adds to the allure. For those who love Louisiana oysters, it doesn’t get much better than this. Here you can write a comment to the post "The Shell Game: for the love of Louisiana oysters"